Friday was a landmark day for the SpaceX Falcon 9 rocket. It launched into space a resupply capsule bearing a new inflatable habitat for the International Space Station. Then the rocket's "first stage" returned to Earth for a sea landing — without exploding. Though the SpaceX rocket had successfully landed on solid ground before, the last attempt to land the rocket on a barge at sea ended in a fiery crash. 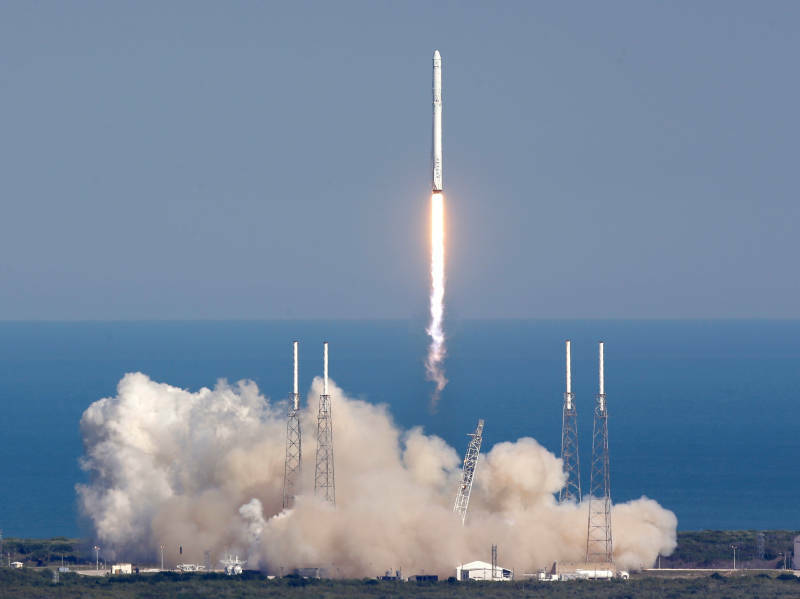 "The SpaceX Falcon 9 rocket lifted off, carrying an inflatable space module that will be added to the station. NASA hopes this kind of expandable room in space could someday help astronauts get to Mars," NPR's Geoff Brumfiel reports for our Newscast Unit. "As the rocket's second stage carried this cargo into orbit, the first stage did something unprecedented. It turned around, flew back to Earth and touched down vertically on a robotic barge floating off the coast of Florida." As NPR's Joe Palca reported earlier this week, the idea for inflatable habitats in space dates back to the 1990s when "the space agency was trying to figure out how to get astronauts to Mars, without the crew going crazy living in a tiny capsule for months on end." When it's folded up, the expandable room is about 6 feet by 6 feet, Joe says, but when inflated, "it's about 12 feet by 10 feet, approximately the size of a small RV." The new habitat could mean more comfortable living during a future trip to Mars. And the successful landing of the SpaceX rocket will mean much more affordable space travel, as SpaceX can reuse the expensive "first stage," Geoff says.